When it comes to dim sum, one of my favorite dishes to order (and horde) is Chinese sticky rice made with Chinese sausage (lap cheong). 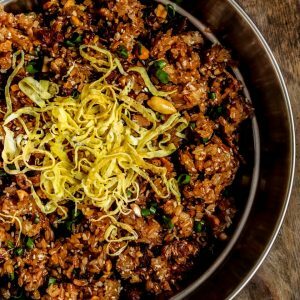 There’s something absolutely satisfying about the little chewy grains of rice that makes this dish so spectacular. One thing I did notice was not all Chinese sticky rice is created equal. 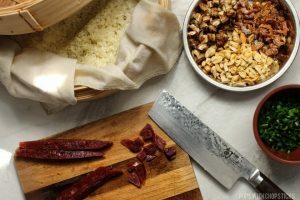 I have had my fair share of flavorless and soggy\mushy Chinese sticky rice which is why it put me on a mission to create a flavorful and deliciously chewy Chinese sticky rice! 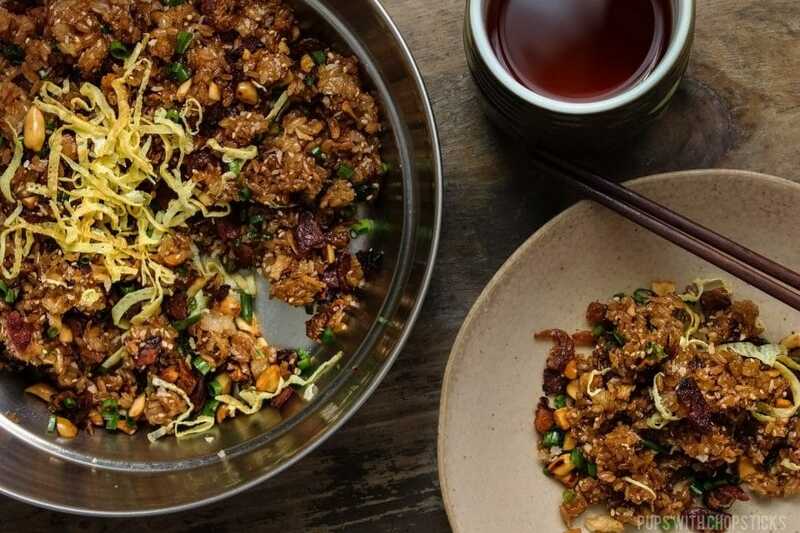 I also put a spin on this and made it crispy for added textures and flavours because my curiosity for different flavours and textures got the best of me and I’m seriously addicted to my crispy bits topping. 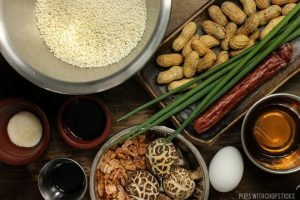 For this Chinese sticky rice recipe, most of these ingredients can be found at an Asian grocery store or online. When you are looking for sticky rice, it may be labeled as sticky rice, glutinous rice or sweet rice. For this particular recipe, I find the short grain sticky rice gives a nicer texture because it has a bit more of chewiness to it. For the shiitake mushrooms, I usually have the dried ones on hand (they last forever!) so I usually use the dried ones but if you have fresh ones, you can use those too – but it will have a slightly softer texture. If you use the dried shitake mushrooms, remember to soak them in hot water for about 30 minutes or until they are soft before using them. Egg is completely optional for this recipe. The egg is used to make thin ribbons and used as a topping at the very end. 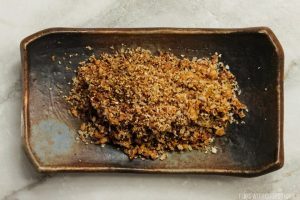 The crispy bit toppings is a combination of sesame seeds, Japanese panko bread crumbs and fried onions – this is a topping that I love using to give any of my dishes a bit of crunch and flavour, like I did with my Crispy Jalapeno Poppers (Rangoon Style). However with all things, I tend to get bored easily with it so I made this a optional topping. 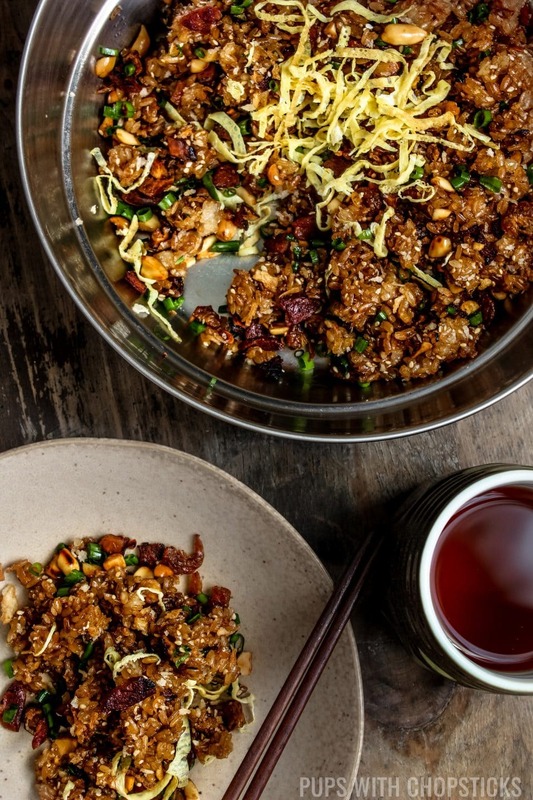 Omitting this crispy topping will make this recipe the traditional Chinese sticky rice. With sticky rice, I find it’s always best to give it a good soak before steaming it. Try to soak it for a minimum of 3-4 hours. I find to get the rice at optimal chewiness, you have to steam it prior to frying it. You can also use a rice cooker but make sure you put in less water than it calls for, especially since it has already been soaked. We can always cook the semi raw rice when we are tossing everything together but we can’t fix overcooked mushy rice. 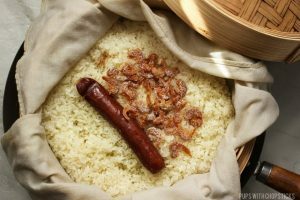 While we are cooking the rice, I like to also throw in the Chinese sausage (lap cheong) and the pre-soaked dried shrimp to give the rice a bit of flavour and to soften up the sausage a bit as well. 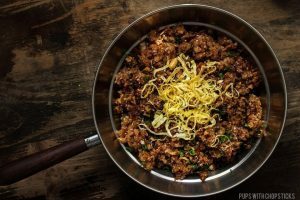 Once the rice has been cooked, it’s a cake walk from here 🙂 All you really need to do is chop up all your ingredients and toss it together in the pan! If you are using a cloth to steam your rice like I did, soak your cloth first. It creates a more even steam around the whole bundle! But what happens if you have rice that’s not fully cooked or a bit dried out from sitting out during the prep stage? Not to worry – we can fix that during the pan frying step. 🙂 Once you add the rice into the pan and start mashing it together with the ingredients (yes, mashing it!) you can add in water 1 tablespoon at a time while you are mashing the rice to remove the clumps. I don’t recommend adding in water in large quantities because you can’t go backwards from mushy rice. When the rice starts to soften up and break apart more easily, do a taste test (just try not to do what I did, and eat a large portion of it! haha) if it tastes chewy and good to you – you’re good to go! If it’s still too dry then add another tablespoon of water and repeat until you get the desired texture. 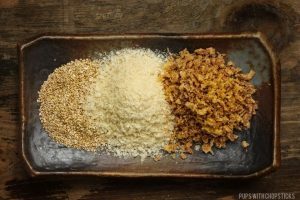 When the pan is hot, add in the sesame seeds, panko bread crumbs and fried onions and keep mixing so it doesn’t burn. Once it’s cooked, roll it up and cut them into ribbons, set aside to top at the very end. Squeeze the excess water from the shiitake mushrooms. If a stem is still intact, cut it out and discard it (they are usually tough). Roughly chop up the shiitakes into small bits. 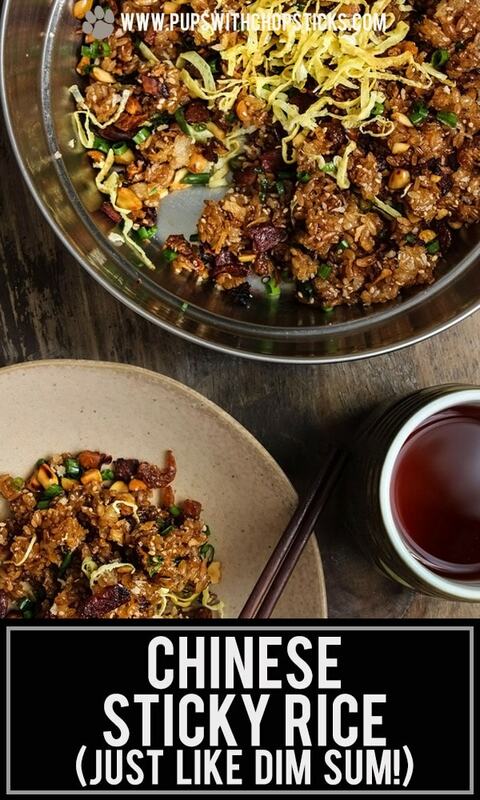 Add in the dried shrimp and shiitake mushrooms and shaoxing rice wine and cook for an additional 1-2 minutes. Add in the sticky rice and gently break it apart with the ingredients. This might take some light smashing to break apart, since sticky rice loves clumping together 🙂 The goal is to try to seperate as much of the rice grains as possible. Add in the dark soy and mix it until the colour gets evenly distributed, keep mixing. At this point, do a taste test. Is it too dry? If it is, add 1 tablespoon of water and keep mixing. Repeat this step until you get the right chewy consistency you want. ooooh yes!!! 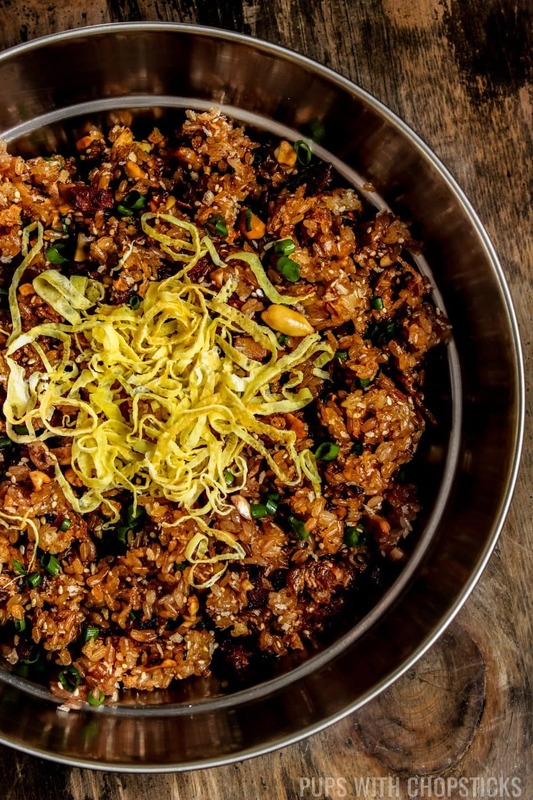 that crispy topping sounds unreal, and i can easily imagine fried garlic in there too :3 also, what’s the difference between no mai fan and lo mai fan? (i’m kind of assuming they’re the same thing, but google is being unhelpful right now lol). This looks totally delicious. I’ve been looking for new rice dishes to try this might it. This sounds INCREDIBLE! I feel like I always choose the wrong Chinese restaurant and end up with disappointing rice (boooo!). Can’t wait to try it on my own at home! Crispy topping part is my favorite. 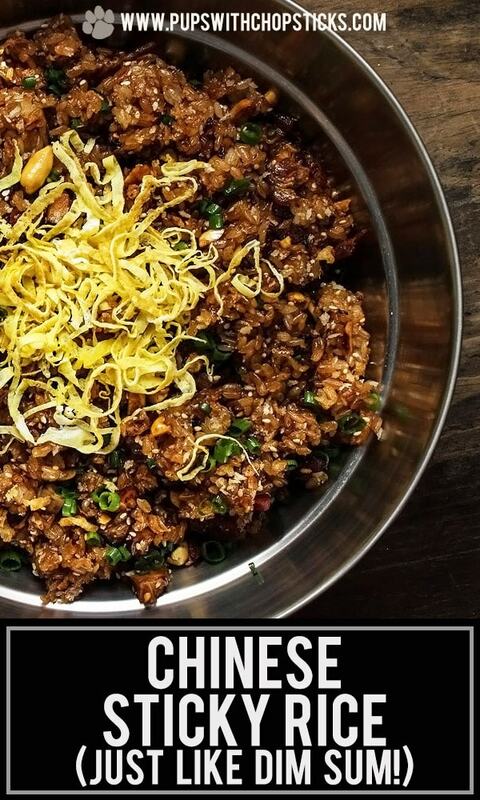 This looks like a delicious side dish! This recipe reminds me of my childhood! I love sticky rice and meat! 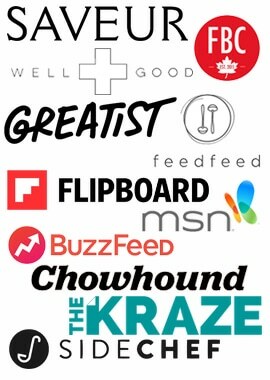 Anytime you need any help, just give me a shout! 🙂 Hope you enjoy!